If we're talking strictly skincare, I think facial masks are my most favorite thing, facial cleanser and scrubs come in a close second, but nothing makes my skin happier than to drink up some luxurious mask at the end of the day. I have quite a collection when it comes to masks because I like to use one almost everyday, it really is the perfect way to unwind after a long day. I have oily/combo skin that is acne prone and I have a decent amount of light scarring from acne as well as large pores (I really hit the skin jackpot here!). 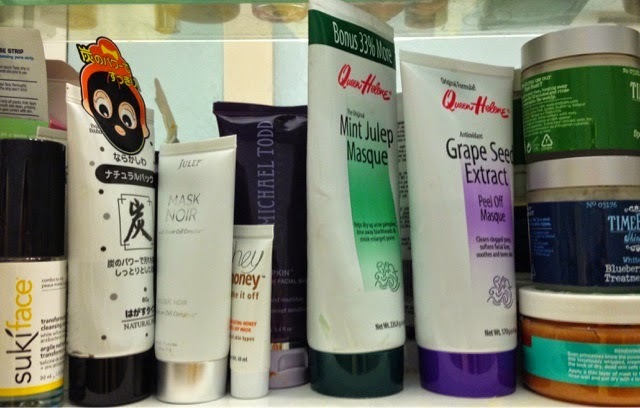 I'm especially interested in masks that fights acne and deep cleans pores but I have some hydrating masks for days where my skin feels dry...which is rare but sometimes it happens! I've split my collection into four categories: hydrating, deep cleaning, clay and peel-off. 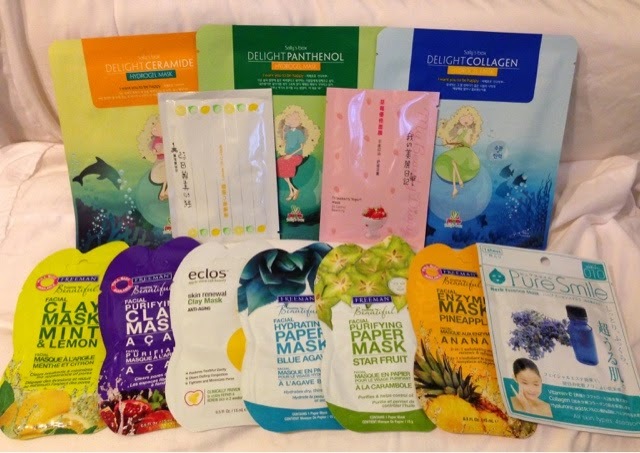 A few of these masks I have full reviews on so I will link those instead of a small blurb! True Blue Spa Pumpkin Face Mask | My very first face mask and it smells exactly like pumpkin pie. Leaves my skin feeling so hydrated, I'm so sad it was discontinued though. Michael Todd Pearl and Silk Mask | Not crazy about this mask. It's a strange clear mask that leaves my skin feeling a little tight, I definitely don't reach for this one often. Queen Helene Mint Julep Masque | I'm surprised I don't have a review on this since I rave about it all the time. Hands down my favorite mask, smells minty fresh and is amazing at drying up pimples for about $3! Michael Todd Charcoal Face Mask | This came in a trial kit so it's the smaller size, it works but it has a really strong smell to it so I don't go for this as often. 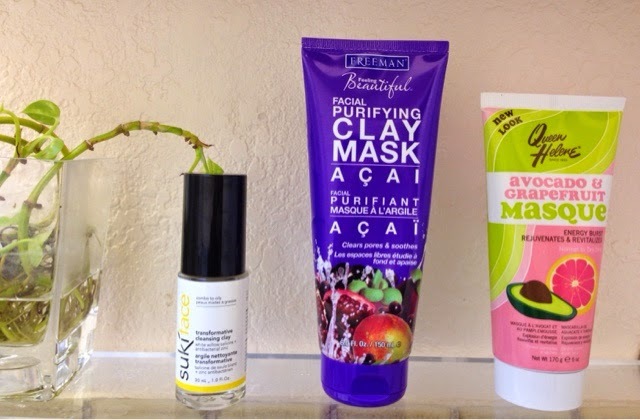 Feeling Beautiful Acai Facial Purifying Clay Mask | This stuff is fantastic! My skin felt tight (in a good way) and there were the clean tingles while I was wearing it. Charcoal Peel Off Mask | This comes from the Japanese dollar store Daiso so I'm not sure on the brand but I love it! It was my first peel off mask and works really well to clean the gunk out of my pores. Honey Peel Off Mask | Honestly not my most favorite mask. It smells fantastic like honey and blossoms but it's difficult to peel off and there isn't much of a difference after use. Julep Mask Noir | I haven't gotten a chance to use this one either but I imagine it's similar to the charcoal mask. MIGABEE Antipollution RE-Peeling | Another honey peel off mask! I also have a drawerful of those single use masks and sheet masks that I'm not going to bother to name out but I will insert a picture below. Since they are single use and I most likely got them in some sort of subscription box or as a gift it's not something I can really go in depth about my thoughts on it since I haven't used it multiple times. What are some of your favorite masks? Wow, you have quite the extensive mask collection - I'm impressed! I love the simple luxury of a face mask, too - Feeling Beautiful masks are my favorites!